Israeli Occupation Forces’ bulldozers demolished Bedouin homes and installations near Al-Taybeh village, north-east of Ramallah, after the IOF stormed the area on Wednesday. Palestinian local sources said that the demolished homes belonged to Bedouins of Al- Kaabneh tribe near of the IOF military checkpoint Karmiel. The IOF imposed a security cordon on the place, prevented journalists and popular resistance activists’ access to it, and erected barriers in Al-Taybeh vicinity. 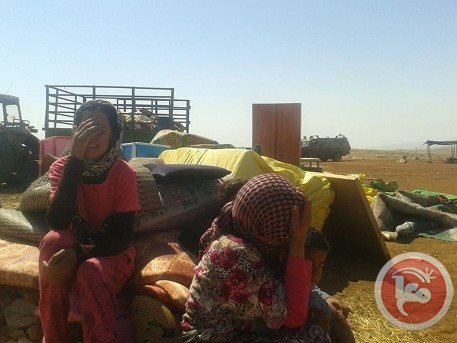 The IOF had earlier Wednesday demolished four Palestinian homes for the fifth time in Khirbet Al-Tawil, near the village of Aqraba in Nablus, and destroyed two houses in Palestinian village of Al-Aqaba, in the northern Jordan Valley, east of Tubas, under the pretext of being built without permit. 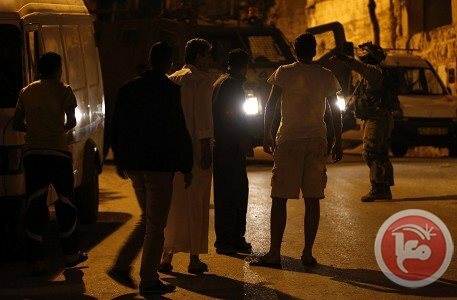 Dozens of Israeli soldiers and members of the Jerusalem City Council invaded, Wednesday, the Ein al-Louza area, in Silwan town, in occupied East Jerusalem, and handed a family orders for the destruction of their buildings. Israel alleges the constructions are without a permit, and that they are located in what it described as “a green area”, although the family owns the land. The family said the orders target two residential buildings belonging to Hammouda and his brother Mahran Siyam. They said the two buildings were built more than ten years ago, and are home to 20 family members. The first building has four apartments on two floors, and the second has one apartment. The family already paid more than 650.000 NIS in fines, and repeatedly tried to obtain all legal documents but Israel kept rejecting their applications, the Maan News Agency said. The Palestinians are largely denied construction permits in occupied Jerusalem, and cannot even modify their existing homes and buildings, while Israel continues to illegally confiscate Palestinian lands for the construction and expansion of Jewish-only settlements. The Israeli Committee Against House Demolitions (ICAHD) stated in a previous report that the Palestinians continue to endure violence, displacement, disposition and deprivation largely in direct violation of International Law. It said around 27000 Palestinian structures have been demolished by Israel in occupied Jerusalem and the rest of the occupied West Bank since it illegally captured the territory in 1967. ICAHD added that, in 2014, Israel demolished 329 Palestinian structures, displacing 629 Palestinians. Israeli forces demolished steel structures belonging to the Palestinian Bedouin community east of Ramallah on Wednesday, locals said. Israeli forces destroyed four steel structures, usually used for housing, near the village of al-Taybeh and another three structures in Mikhmas village. The structures belonged to Yousef Mousa Ahmad Kaabneh and Moussa Yousef Kaabneh. In Mikhmas, Israeli forces raided the community and evacuated residents before demolishing the structures. Israeli soldiers prevented journalists from reaching the area during the demolition. The Bedouin community resettled to areas of what are now the southern and eastern occupied West Bank after being expelled from the Negev during the creation of the Israeli state. Israeli forces on Wednesday demolished four Palestinian homes in the Nablus village of Aqraba, a Palestinian official said. Ghassan Daghlas, who monitors settlement activity in the northern West Bank, told Ma'an that a large group of Israeli soldiers escorted a bulldozer to the village. Israeli forces then demolished four old houses in the al-Taweel neighborhood which belonged to Muhammad Sudqi Salih and his brother Anwar. The houses were over 100 years old. The al-Taweel neighborhood is on the outskirts of Aqraba and locals say Israeli forces have targeted several properties in the area under the pretext that they were built without a permit. 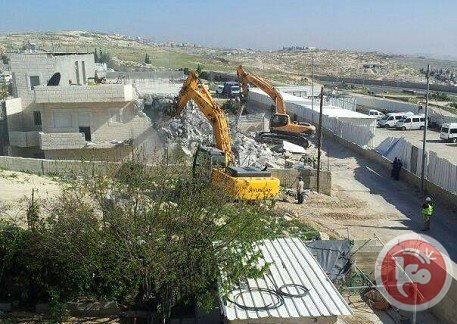 The Israeli army, Tuesday, demolished a man-made cave and shed being used to shelter a Palestinian family in al-Walja, a small village established to the northwest of Bethlehem. 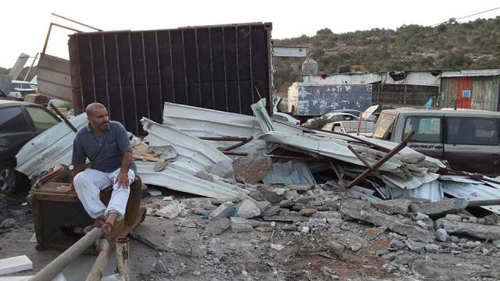 Ammar Abu Attin, an activist with the anti-settlement committee in the village, said that an Israeli team, accompanied by a bulldozer, stormed the area and proceeded to demolish a cave and the shed owned by a 50-year-old local resident. The structure has been used to shelter the man and his family for 15 years, now, according to WAFA Palestinian News & Info Agency. The family has so far refused to leave the land, which Israel is attempting to take over for the benefit of settlement expansion. The owner of the property, Abd al-Fatah Abd Rabo, says he has been subjected to the ugliest of Israeli poloicies, throughout the years, as they aim to force off his land, adding that he remained steadfast in his land and continued to live in the cave, up until forces demolished it today on Tuesday. Over 550,000 colonial settlers now live in continually expanding developments across the region, in contravention of international laws to which Israel is signatory. At the same time, Palestinians are rarely given building permits, as Israeli settlements continue to divide and disenfranchise Palestinian communities in massive increments. Homes and villages are bulldozed to the ground, leaving entire families displaced; agricultural establishments are damaged or destroyed entirely, turning what remains of Palestinian communities into isolated ghettos, even for those holding Israeli citizenship. Settler violence against Palestinians and their property is common througout both Israel and the occupied Palestinian territories, often in conjunction with either the failure of police and military to uphold the law or their full-on backing thereof. 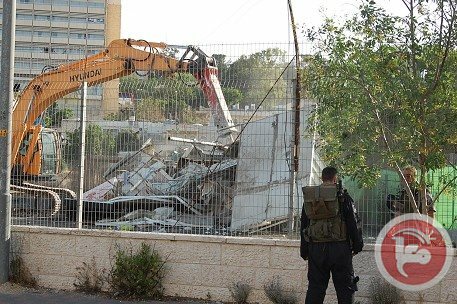 Israeli forces demolished a residential building in the al-Tur neighborhood of Jerusalem on Monday on the pretext that it was built without a permit. Members of the Ghazzawi family, who own the building, told Ma'an that Israeli soldiers escorted bulldozers to the area and began tearing down the building. Family members were not given any time to remove their belongings. Tawfiq Ghazzawi said the two-story building was built in 1997 and contained two apartments, one for him and his mother and another for his brother, Ayid. 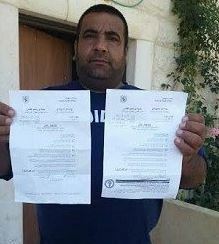 The family have already paid fines of over 200,000 shekels ($57,126) and have been refused a construction permit several times by Israel's Jerusalem municipality. Israeli forces overnight Sunday demolished the Hebron homes of two Palestinians named as suspects in the kidnapping of three Israeli teenagers in June, locals said. Israeli forces demolished the homes of Amir Abu Eisha and Husam al-Qawasmi and sealed off the home of Marwan Qawasmi by pumping concrete into the property. Locals said large numbers of Israeli forces arrived first at the home of Abu Eisha in the Wadi al-Sir neighborhood and ordered the family to evacuate the home. Army engineers then set explosives in the house and blew up the property, turning it into rubble. Israeli soldiers then moved to the Abu Kteila neighborhood and destroyed the home of Husam al-Qawasmi. Clashes broke out between locals and soldiers, with several Palestinians injured by rubber-coated steel bullets, including a journalist Radi Karamah. The home of Marwan Qawasmi was sealed off by pumping large amounts of concrete into the house. Several mixer trucks were at the scene of the incident. Israel accuses the three men of kidnapping and killing three Israeli teenagers near the illegal Gush Etzion settlement bloc in Hebron in early June. Marwan Qawasmi was detained by Israeli forces in July. Israel accuses Qawasmi of ordering Abu Eisha and Husam al-Qawasmi to carry out the abduction. Israeli rights group Hamoked had petitioned the Israeli high court to stop the demolitions, arguing that the measure would harm innocent people, including children, and constitutes collective punishment. "The demolition of the terrorists' homes conveys a clear message to terrorists and their accomplices that there is a personal price to pay when engaging in terror and carrying out attacks against Israelis," Israeli army spokesman Lt. Col. Peter Lerner said. Israel launched a widespread search and arrest campaign in the occupied West Bank following the kidnapping of the teenagers, targeting Hamas affiliates and infrastructure and detaining hundreds of people. Israeli forces killed at least six Palestinians during the arrest raids. Jewish extremists kidnapped and killed Palestinian teenager Muhammad Abu Khdeir in early July in a revenge attack. The Israeli occupation forces (IOF) detonated at dawn Monday in Al-Khalil city the houses of Amer Abu Aisha and prisoner Husam Qawasmeh, and concreted the inside of another house belonging to Marwan Qawasmeh. All of them are accused by Israel of kidnapping and killing three Jewish settlers last June. Local sources reported that hundreds of Israeli troops encircled the houses of Amer Abu Aisha and Marwan Qawasmeh in Al-Sair area and the house of Husam Qawasmeh in Beir Al-Mahjaz area in Al-Khalil. The invading troops brought concrete pumping equipment and barbed wire, and embarked on cordoning off the house of Marwan and pouring concrete into its rooms. At the same time, other soldiers planted explosives in the houses of Amer and Husam and blew them up. 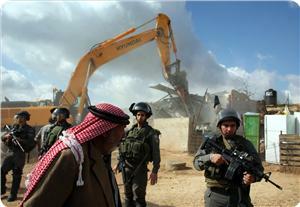 Consequently, violent clashes broke out between citizens and Israeli soldiers following the detonation of the houses. 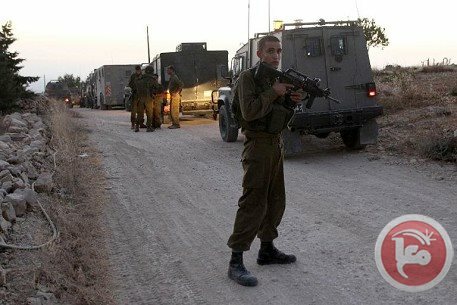 Israeli forces raided the Deir Istiya area in Salfit early Wednesday and detained four Palestinians while shooting live bullets and stun grenades, the mayor said. They were among at least 12 detained overnight in the occupied West Bank. The mayor said Israeli forces detained Muhammad Maher Farid, Muhannad Abd al-Qader Zeidar, Youssef Ahmad Abd al-Qader Zeidan and Khalil Muhammad Khalil Hakim. The house of Munir Mansour was turned into a military post, Ayyub Abu Hajla said. The house, which was still under construction, was raided because it is on a main road used by both Israeli and Palestinian vehicles. Clashes often erupt in the town, especially on the western entrance which Israeli soldiers shut with rocks and barriers. Locals repeatedly attempted to re-open the entrance but soldiers shut it every time. Israeli forces confiscated thousands of acres during the last few months, and the town is surrounded with settlements. A youth from Deir Istiya was injured in the hand with live fire on Monday. Earlier an Israeli army spokeswoman told Ma'an that soldiers arrested 12 Palestinians in the West Bank. WAFA added that the settlers attacked various stores, adjacent to Osama Bin al-Monqeth School that was illegally occupied by Israel, and was turned into a Jewish religious school. The settlers used ladders, hammers, and other equipment to smash the doors of the Palestinian stores. In related news, Israeli soldiers invaded Barta’a ash-Sharqiyya village, isolated behind the Annexation Wall, south of the northern West Bank city of Jenin, and demolished a factory that produces construction bricks, and a car repair workshop. In addition, the soldiers attacked a local reporter, identified as Baha’ Qabaha, who was documenting the attack. Eyewitnesses said at least five military vehicles and a military bulldozer invaded the village, and demolished the structures.